Most Ben Franklin imprints are English-language. But Ben was also interested in tapping into Pennsylvania's burgeoning market of German-speaking book buyers. In 1751, Ben sent his printing partners to Lancaster to open shop here. (See above.) 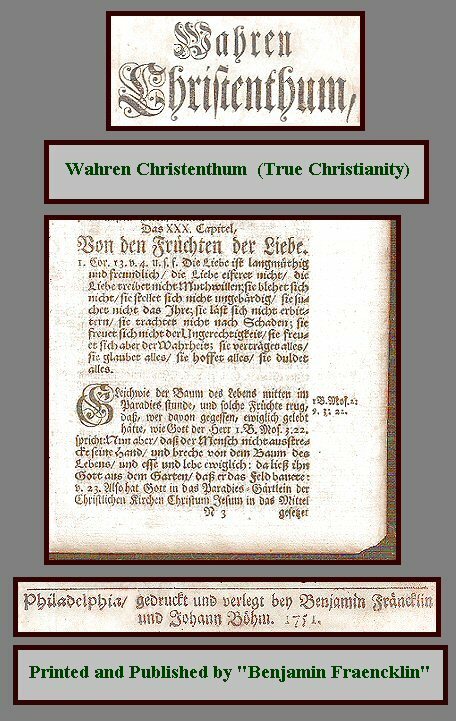 This same year he and Johann Boehm printed the popular Lutheran devotional text, Wahren Christenthum (True Christianity), authored by the German Pietist Johann Arndt. Ben apparently obtained his fraktur fonts from the Egenolff-Berner-Luthersche type foundry in Frankfurt, Germany. Some eleven years earlier, circa 1740, Christopher Saur of Germantown, near Philadelphia, had printed the first type specimen sheet printed in America. That sheet used these same blackletter fonts.